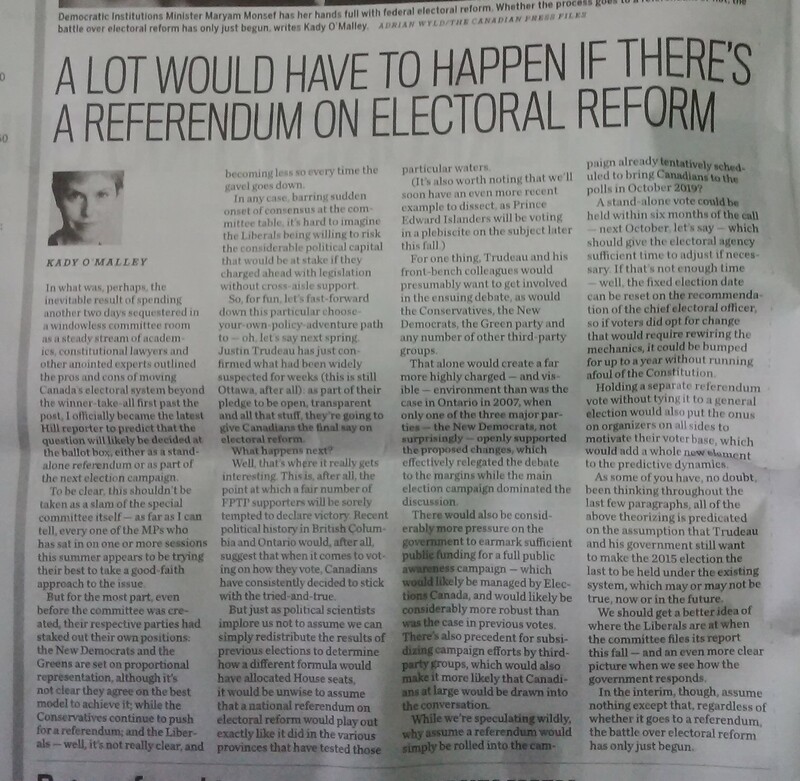 Kady O’Malley’s column in the Ottawa Citizen of 27 August 2016, “A Lot Would Have to Happen If There’s A Referendum on Electoral Reform,” contained some bizarre, false premises on the nature of electoral law, from the electoral system itself, to holding a referendum on altering it, to the fixed-date elections law. While we’re speculating wildly, why assume a referendum would simply be rolled into the campaign already tentatively scheduled to bring Canadians to the polls in October 2019? A stand-alone vote [on a referendum] could be held within six months of the call – next October, let’s say – which should give the electoral agency [Elections Canada] sufficient time to adjust if necessary. If that’s not enough time — well, the fixed election date can be reset on the recommendation of the chief electoral officer, so if voters did opt for change that would require rewiring the mechanics, it could be bumped for up to a year without running afoul of the constitution. I shall examine these premises in order. That the Canada Elections Act allows the Chief Electoral Officer to recommend postponing the fixed-date election by up to one year. First, in principle, a referendum could be held, but at this stage, I doubt that one will be held, if only because a referendum would force the Liberals to take a coherent viewpoint on electoral reform and advocate for one system over another. Thus far, the Prime Minister has signalled his support for Australian-style instant run-off balloting, but the Trudeau II government itself has refused to make a coherent argument and case for any electoral system; instead, Minister Monsef keeps banging on about the inherent virtue of incessant “consultation” — provided that “consultation” does not involve a referendum — and her website states ambiguously that “Federal electoral reform is part of the Government’s commitment to change.” But the Liberals have refused to provide a coherent rationale and argument for “change” because they regard “change” as axiomatically good in an of itself and treat it as a given that does not need to be explained. Cabinet might have to introduce a bill to amend the existing Referendum Act, but under the current legislation, it is the responsibility of Cabinet to trigger a referendum through an order-in-council. Second, Elections Canada could prepare to administer the next scheduled general election in 2019 under a new electoral system if and only if that new system were the ranked ballot of Australian-style instant run-off balloting precisely because it would not require any constitutional amendment and would keep the boundaries of the existing electoral districts intact. In short, this is because switching to mixed-member proportional representation (which includes a mixture of seats based on larger geographic electoral districts and compensatory party seats divorced from geographic constituencies) or to single transferable vote (which is based on larger multi-member geographic electoral districts) would each require a constitutional amendment and altering the boundaries of electoral districts — a process which would take almost two years. Furthermore, the current wording of section 51(1) of the Constitution Act, 1867 means that the Decennial Census is a necessary condition for redistributing the seats and establishing the electoral boundary commissions, and this mandatory headcount will next occur in 2021. (You can read a more detailed explanation of this argument in my piece in the Macdonald-Laurier Institute’s Inside Policy, or here on Parliamentum). Third, the Canada Elections Act most certainly does not allow the date of the next scheduled general election to be postponed up to one year on the recommendation of the Chief Electoral Officer! At most, he can recommend that the general election be postponed for two weeks — and even then, only if the original date conflicted with a religious or cultural day of some kind. This is all very obvious upon any reasonable interpretation of a plain reading of section 56.2 of the statute. 56.2 (1) If the Chief Electoral Officer is of the opinion that a Monday that would otherwise be polling day under subsection 56.1(2) is not suitable for that purpose, including by reason of its being in conflict with a day of cultural or religious significance or a provincial or municipal election, the Chief Electoral Officer may choose another day in accordance with subsection (4) and shall recommend to the Governor in Council that polling day be that other day. (2) If the Chief Electoral Officer recommends an alternate day for a general election in accordance with subsection (1), he or she shall without delay publish in the Canada Gazette notice of the day recommended. (3) If the Governor in Council accepts the recommendation, the Governor in Council shall make an order to that effect. The order must be published without delay in the Canada Gazette . (4) The alternate day must be either the Tuesday immediately following the Monday that would otherwise be polling day or the Monday of the following week. (5) An order under subsection (3) shall not be made after August 1 in the year in which the general election is to be held. Normally, the election would be held on “the third Monday of October in the fourth calendar year following polling day for the last general election”. However, under section 56.2(1) if this date would otherwise conflict “with a day of cultural or religious significance or a provincial or municipal election”, then the Chief Electoral Officer can recommend that election day occur instead with the “limitation” (as the marginal note for section 56.2(4) says) that “the alternate day must be either the Tuesday immediately following the Monday that would otherwise be polling day or the Monday of the following week.” In other words, election day can only be delayed for either one day or one week. Furthermore, section 56.2(5) adds that if the Governor-in-Council accepts the Chief Electoral Officer’s recommendation, it cannot issue the proclamation permitting this delayed “after August 1 in the year in which the general election is to be held.” Therefore, a delay must be planned at least two and a half months in advance, which would in turn probably exclude, in practice, any reason not already listed in section 56(2).1, like natural disasters, since they tend not to announce themselves 10 weeks in advance. Instead, section 59 of the Canada Elections Act covers this possibility. 59 (1) The Governor in Council may order the withdrawal of a writ for any electoral district for which the Chief Electoral Officer certifies that by reason of a flood, fire or other disaster it is impracticable to carry out the provisions of this Act. (2) If the Governor in Council orders the withdrawal of a writ, the Chief Electoral Officer shall publish a notice of the withdrawal in the Canada Gazette and issue a new writ ordering an election within three months after publication of the notice. (3) The day named in the new writ for polling day may not be later than three months after the issue of the new writ. Essentially, these emergency provisions allow the Governor-in-Council, on the Chief Electoral Officer’s recommendation, to delay the election of members only in the electoral districts affected by a natural disaster like a flood, since it would be unnecessary to delay the entire general election itself. One of the few concrete effects of the fixed-date election laws in Canada has been to limit the maximum life of a parliament or legislature from five years to somewhere between four and five years. Therefore, section 56.1 of the Canada Elections Act acts as a hard limit for the date of the next election unless parliament decides to amend or repeal the provision and revert back to baseline established in section 50 of the Constitution Act, 1867 and re-affirmed in section 4(1) of the Constitution Act, 1982. So while delaying the next general election and “bump[ing it] for up to a year” would indeed not “run afoul of the constitution,” it would violate the Canada Elections Act. As that legislation currently stands, it most certainly cannot do what Kady O’Malley claims. Does Budget 2019 Acknowledge That Electoral Reform Won’t Happen Before 2019?